The flying insects this brilliant sky predator takes must be near-sighted and insensitive to color. Other flycatchers are of subdued color, but not this little fellow. 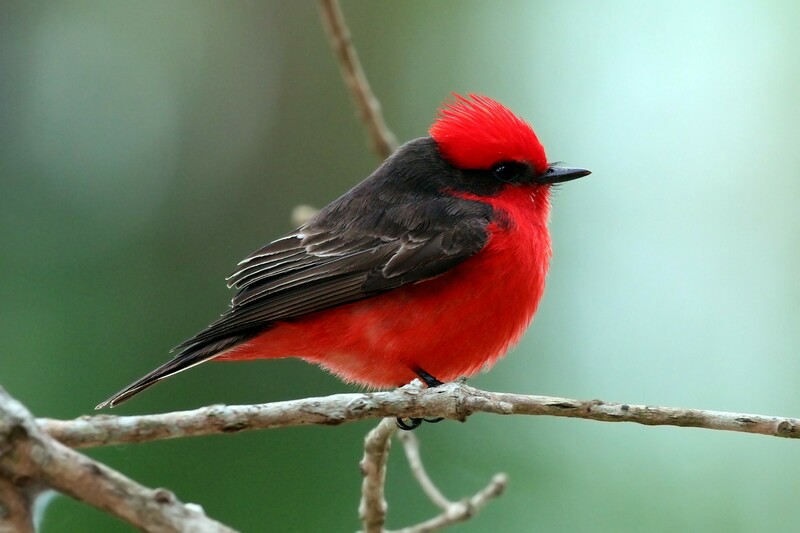 Despite brilliant plumage, however, the male Vermilion Flycatcher is not overconfident. He courts his chosen mate by hovering and singing to her high in the air and by offering her butterflies and other brilliant insects. Nest: The birds build loose nests of grass and twigs in trees. The male brings food to the female while she incubates two to four white or creamy eggs with bold dark blotches and small lighter spots. .